PUNE: If you saw an elegant Kunal Bhide gliding around courts, you would not believe he had actually toppled top seed Amit Kshtriya to guide Pune to lift the U-19 boy’s state badminton team title, defeating Mumbai suburb 2-1, at WIE Sports Complex here on Saturday. The second seed Kunal was excellent, uncorking an array of controlled shots to defeat Amit 18-21, 21-19, 21-15 in the decider. Before this, Pune and Mumbai suburb were deadlocked at 1-1. After dropping the first set 18-21, Kunal came back strongly to clinch the second 21-19. In the final set, Kunal was too good for Amit. He took the game away from the top seed in a jiffy, defeating him 21-15. 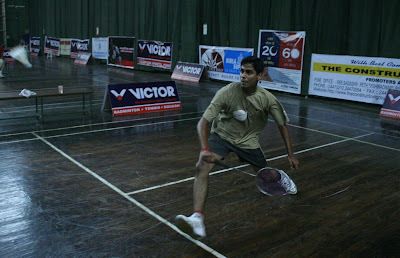 Earlier, fifth seed Nihar Tilekar gave a rousing start for Pune by defeating unseeded Purav Satyamurthy 21-17, 21-13. The good start given by Nihar, however, was wasted by Pune combo Siddhant Ghorpade and Varun Gujar. They lost the doubles to Mumbai suburb’s Purav Satyamurthy and Parin Chopda 19-21, 18-21. Earlier, the spectators had a rare glimpse of badminton limelight when Pune’s U-19 girl’s team bagged the title easing out Thane 2-0. In the singles final, Thane had looked like pulling off the first set when Saili Rane required just two points, but second seed Mudra Dhaimje of Pune fought back to win 21-19. The second set was quite an easy task for Mudra, though Dhaimje gave some initial hiccups. She won 21-14. In the doubles final, Pune doubles team Pradnya Gadre and Shweta Kelkar prevailed over Thane combo Saili Rane and Ankita Malgaonkar 21-11, 21-12. RESULTS: U-19 boy’s team final: Pune bt Mumbai suburb 2-1: Singles: Nihar Tilekar (Pune) bt Purav Satyamurthy (Mumbai suburb) 21-17, 21-13; Kunal Bhide (Pune) bt Amit Kshtriya (Mumbai suburb) 18-21, 21-19, 21-15; Doubles: Parin Chopda-Amit Kshtriya (Mumbai suburb) bt Siddhant Ghorpade-Varun Gujar (Pune) 21-19, 21-18; U-19 girl’s team final: Pune bt Thane 2-0: Singles: Mudra Dhaimje (Pune) bt Saili Rane 21-19, 21-14; Doubles: Pradnya Gadre-Shweta Kelkar (Pune) bt Saili Rane-Ankita Malgaonkar 21-11, 21-12.